Termites have existed for a long time and are some of the oldest insects around. They have a very specialized job in that they feed on wood and serve an important function in nature by converting dead trees into organic matter. Unfortunately, the wood used in architectural structures is equally appetizing to termites. 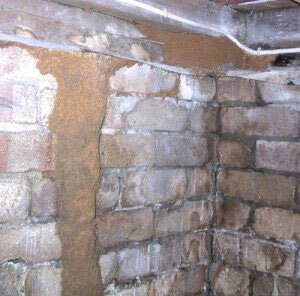 Termites cause serious damage to residential and commercial buildings alike. Usually, the first sign of a termite problem is the swarm. It’s called a swarm because large quantities of termites in their reproductive stage start flying. This could take place inside or outside. This usually occurs in the spring. The reproductives can come in numbers as large as hundreds or thousands. Oddly enough, the reproductives don’t damage wood, don’t bite, and don’t really do much of anything except scout out the area for a mate with which to begin a new colony. After a brief flight, the winged males and females return to the ground and shed their wings. The wingless males and females pair off and a new king and queen are thus established. This royal couple begins the search for sources of wood and moisture in the soil. The next course of action is to begin the colony. This starts when the new king and queen dig a chamber in the soil near wood, enter the chamber and seal the opening. After mating, the queen starts laying eggs. From these humble beginnings she may live up to 25 years and lay more than 60,000 eggs in her lifetime! These eggs are yellowish white and hatch after an incubation of 50 to 60 days. The ones who really do the damage are the workers. Full-grown workers are soft-bodied, wingless, blind and a creamy white color. In the early stages, they are fed predigested food by the king and queen. Once workers are able to digest wood, they provide food for the entire colony through a process called trophallaxis. This is a process by which a worker ingests wood or cellulose which is then broken down and regurgitated to feed and benefit others in the colony. The workers perform all the labor in the colony such as obtaining food, feeding other caste members and the immature forms, excavating wood, and constructing tunnels. Workers mature within a year and live from three to five years. Less numerous than the workers are the soldier termites. Their only function is to defend the colony against invaders. These soldiers are also soft-bodied, wingless, blind and a creamy white color. The head of the soldier is enormously elongated, brownish, hard and equipped with two jaws. Soldiers are dependent on the workers for food and live up to five years. To the untrained eye, flying ants and swarming termites are difficult to tell apart. Termites have relatively straight, bead like antennae, while ants have elbowed antennae. Termites and ants both have two pairs of wings (front and back). 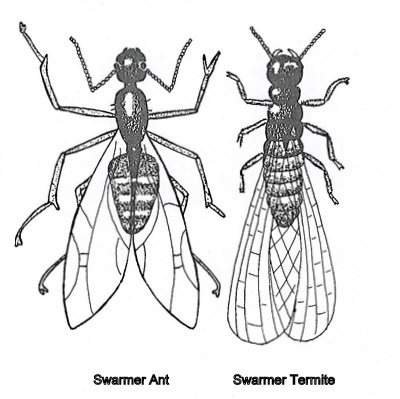 Both sets of termite wings are of equal length while the forewings of an ant are much larger than the hind wings. TIP: The easiest way to tell the difference is to look at the waist of the insect. If the waist appears to be pinched like a girdle then it’s an ant.